Photofuel will develop a next generation technology for the sustainable production of alternative, liquid transportation fuels. The challenge is to advance the base technology of microalgae cultivation in closed bioreactors by enabling phototrophic algae or cyanobacterial microorganisms to produce alkanes and alcohols, which are excreted to the culture broth for direct separation without cell harvesting. 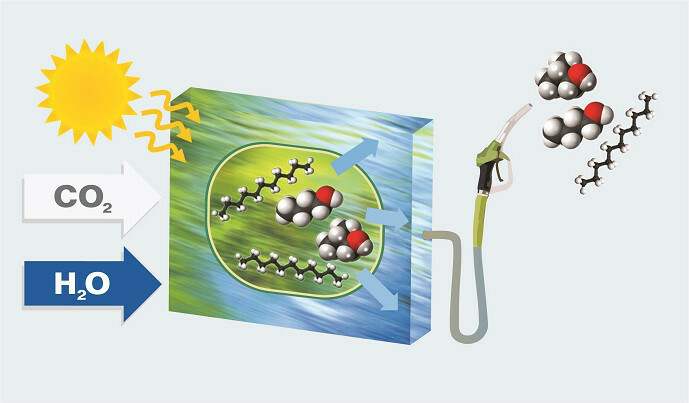 This thereby turns the microbial cells into self-reproducing biocatalysts allowing the process to directly convert solar energy, water and CO2 into engine-ready fuel instead of being used to form biomass, as shown in the figure above. This direct production of engine-ready fuel improves the energy efficiency of several steps along the chain: The biomass production is limited to the minimum needed to maintain the catalyst. This maximizes on the one side the flux of metabolic energy to fuel production and reduces on the other side the input demand e.g. for fertilizer. The energy-intensive cell harvesting is omitted as the biomass does not need to be dried prior to lipid extraction and trans-esterification of lipids is eliminated. For example, undecane is a drop-in fuel we expect to directly replace diesel or kerosene, while addition of butanol and octanol will alleviate the boiling point/vapor pressure problems of E5 and E10 gasoline without a need to exchange the already existing infrastructure for storage, distribution and utilization in vehicles. The final goal is to advance the solar fuel technology towards the aim of highly sustainable production of drop-in fuels on arid or marginal land. Economically and environmentally sustainable large-scale systems for geographically independent conversion of solar radiation into chemical energy would support rural communities and substitute significant shares of fossil energy for the benefit of Europe and many other regions.